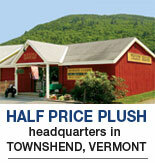 Half Price Plush specializes in selling retired Mary Meyer stuffed animals at Low Discount Prices. Beautiful, top quality, SAFE stuffed animals are what we offer. The Mary Meyer Company designs and manufactures a large variety of top quality stuffed toys and distributes her toys to department stores, toy stores, gift shops and other retail stores throughout the USA, Canada and to 15 other countries around the world. Mary Meyer and her husband Hans Meyer started their business in 1933 and today (85 years and 4 generations later) it distributes 500 different designs to 10,000 wholesale customers. Each year we create 150 new designs and retire 150 of last year's designs. Halfpriceplush.com offers prepacks of retired Mary Meyer toys (all first quality) at reduced prices. They can be used for resale as gifts, prizes, charities, fund raising, by organizations, businesses and individuals for personal use. Mary Meyer toys are perfect for everyday gift giving, for infant and baby gifts, and for seasonal events such as Christmas, Easter, Valentines, Halloween, Graduation and Mother's Day. Do you need plush animals for gift baskets? Are a florist needing stuffed toys to combine with flowers? A confectionary store needing teddy bears to combine with candy? We have the right toys for you. Are you a hospital gift shop or an infants and baby store? We have musical plush toys for babies along with a variety of pink and blue stuffed animals. Whatever your needs, we have a large variety of stuffed toy animals at reduced prices to fit your budget. Years ago the six children of the Meyer family were our stuffed toy testers. That's done differently today. Now we test and retest our toys throughout the design, manufacturing and distribution stages. High-quality, attractive and safe stuffed animals are our business.